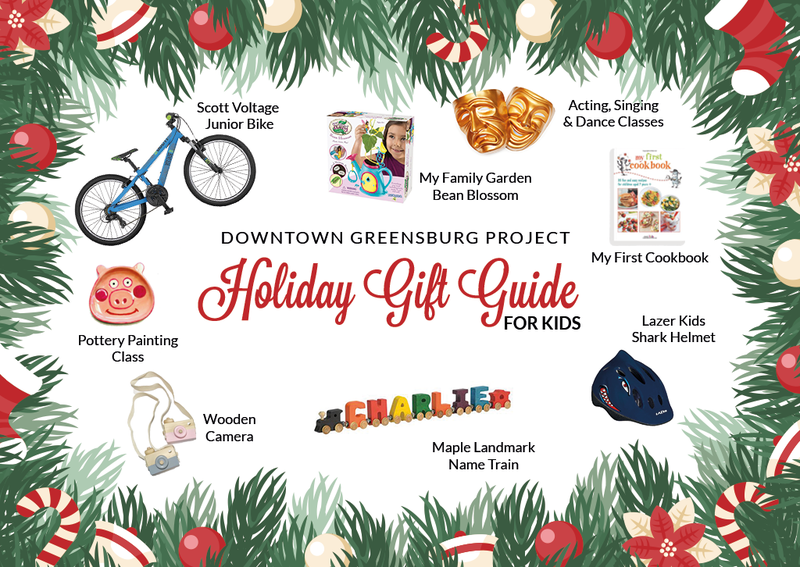 Next up is our guide to finding the perfect gift for the kid that might just have everything! Scott Voltage Junior – Bikes are always a great gift for kids! With all the hills in our area, a mountain bike is your best bet for kids of any age. Finding a bike at a big box store usually means it was put together by the same person who put together the picnic tables. By heading to Downtown Greensburg’s premier bike shop, Flat Tire Co. on E. Pittsburgh St. they’ll find you the perfect ride and make sure it will last! Wooden Camera – One of our favorite new businesses in Greensburg is Locally Raised Little Ones, a online and pop up boutique, that carries super trendy unique infant and toddler items! These adorable wooden cameras are a great toy for any small child! Pottery Painting Classes – Who doesn’t love to paint something that you can use later on! We love going to Pottery Playhouse on N. Main St. and finding all kinds of pieces to paint. From plates, to animals to anything in between, they have tons of things to choose from to let your child’s artistic side loose! My First Cookbook – We loved to cook as a kid and still do! Start them out young and have them learn the basics of cooking and to make delicious healthy meals on their own! This fun cookbook and a bunch of other children’s books can be found at Penelope’s Gifts and More on S. PA Avenue. My Family Garden Bean Blossom – When we saw this set at Descendants Children’s Boutique on W. 2nd St. we knew we had to add it to our gift guide! Plant, grow and play with this playful set that has magical beans that feature messages that will appear on the greenery when the plant grows! Acting, Singing and Dancing Classes – When we were younger we loved acting, singing and dancing and Stage Right fosters any child’s imagination with their classes! They perform throughout the year and have so many opportunities to learn a lot about theatre, dancing and singing! Maple Landmark’s Name Train – Pick out all the letters for your child’s name to create a wooden name train at RSVP Greensburg! We thought this was a fun and create gift for any little tike, grab more letters than their name and they can spell out their own words! Lazer Kid’s Shark Helmet – Dun, dun, dun, dun. Shark!! Your little rider will LOVE this shark helmet that you can find at Flat Tire Co! Not in to sharks? No worries they have a bunch of different ones or can easily order whatever you need in time for Santa to shimmy down the chimney!